Wellington, FL – February 6, 2013 – Silvia Rizzo’s trademark platinum blonde hair and blue sunglasses are a familiar sight on the winter dressage circuit in South Florida this season. Add Rizzo’s special brand of bling to the flashy bay-black Oldenburg stallion she’s brought to Wellington, Donnerbube 2, and you’ll understand why the pair has amassed a fan club. Her bubbly personality paired with her style in the show ring while riding the licensed breeding stallion she affectionately calls “Bubi” has created a loyal following in South Florida. Their fans followed Rizzo and her horse when the pair started the season with strong performances. They started with an 11th place in the Grand Prix and climbed up to a seventh place in the Grand Prix Freestyle at the Gold Coast Opener CDI-W Jan. 18-20. 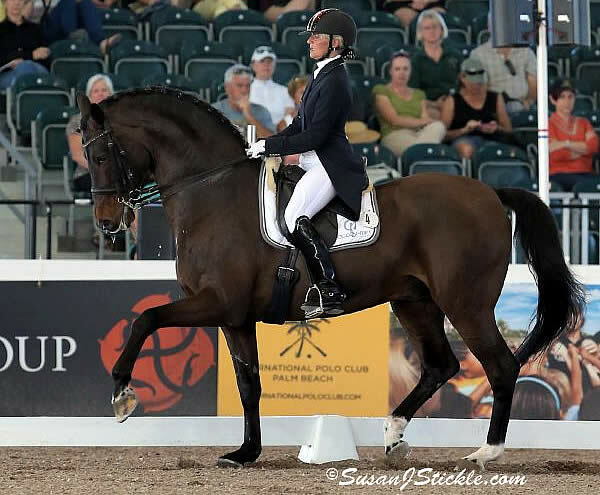 At the World Dressage Masters CDI5* Palm Beach the following weekend, she scored a 65.255% in the Grand Prix and earned fifth place in the Grand Prix Special with a 64.917% against a top-notch field of riders from Europe, Canada and the United States. Rizzo, a native of Italy who lives and trains in Germany at her own Hof Marabunta, will ride Donnerbube 2 in the Wellington Classic Spring Challenge CDI3* at the Jim Brandon Equestrian Center in West Palm Beach, Feb. 8-10. They will compete in Friday’s Grand Prix and Sunday’s Grand Prix Freestyle. 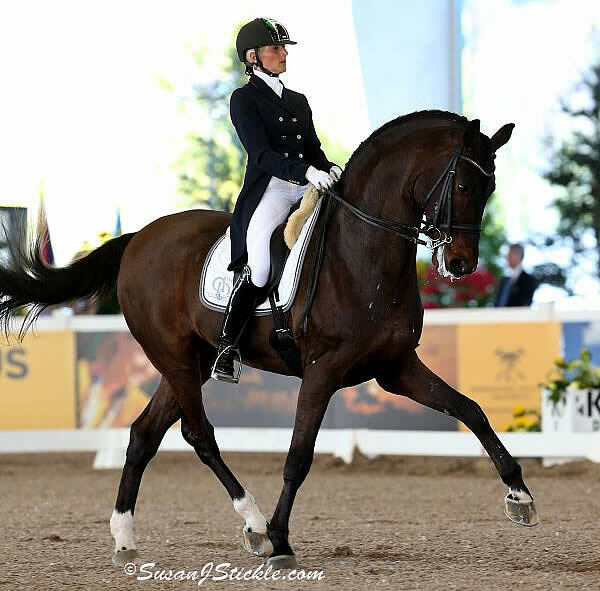 She and Bubi are aiming for the 2013 ECCO FEI European Dressage Championships in Denmark in August by preparing with performances at mainstays around the globe, including the exclusive CDI4* invitation-only in Doha, Qatar, and the CDI 5* Falsterbo in Sweden. “I want to keep going and show him on this level, in big shows with these good results, to bring me to the Europeans in top form and ready,” she explained. This is Rizzo’s first time competing in the United States, and she’s already making plans to return. She intends to spend several months in Florida next winter, arriving in December and staying through the end of March, planning a full competition schedule and hoping to schedule some clinics. Her partner Michele Betti, an internationally acclaimed eventing and show jumping trainer and the former Italian Olympic team eventing coach, will be at her side and available for lessons as well. In addition, with a large, established network of clients across three disciplines, both Rizzo and Betti can help riders find the ideal horse in Europe. Her love of the area extends beyond the results she’s had at the shows and the fan club she and Bubi have collected. Although she has been putting most of her energy into working with her horse, Rizzo has been enjoying the Florida scenery and attractions, visiting the beach and Disney World, where she proudly had her photograph taken with Mickey Mouse. Rizzo said she has many to thank for their support while in South Florida including sponsors Accademia Italiana, a brand of upscale equestrian clothing, Selleria Pariani, an Italian producer of leather goods, Craig Bernstein with Triple Crown Feed, and Katharina Stumpf, a friend who has helped with logistics while in the U.S.